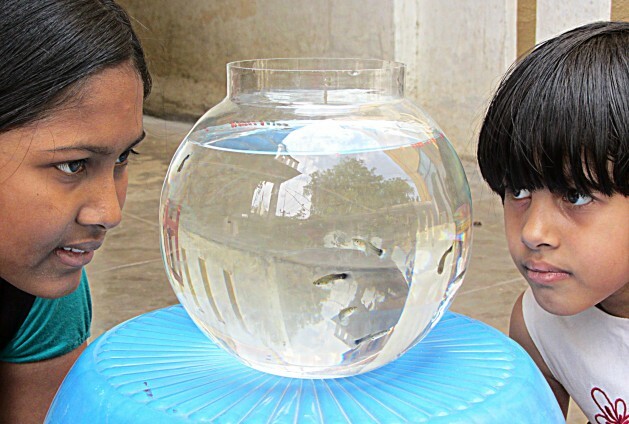 Children in India’s southern city Mangalore promote demonstrations of guppy fish feeding on mosquito eggs. Credit: Stella Paul/IPS. Last month the St Aloysius’ high school in Mangalore city of southern India where Monteiro studies, launched a “Guppy movement” – an anti-malaria campaign in collaboration with the Mangalore City Corporation. The campaign aims to control malaria using natural means – such as the Guppy fish. Volunteers who have joined the campaign visit local hospitals and schools carrying jars of water with mosquito larvae and Guppy (Poecilia reticulate) to demonstrate how the fish feeds on mosquito larvae. The campaigners also stage street plays to spread anti-malaria messages. Monteiro learnt about Guppy fish at one of these plays. The campaign is drawing particular attention around Malaria Day on Friday Apr. 25. Far away from Mangalore in Shillong, a hill city in northeastern India, the state government is organising a workshop on malaria prevention. Those attending include government staff and health activists, and they are being taught that breeding fish like Guppy is an effective way to control vector-borne diseases. Sangma says the state has already seen a 50 percent drop in all mosquito-borne diseases since it took up breeding Guppy fish for malaria control in 2012. The first known use of Guppy fish in India for such purpose was in 1908 when a British army officer who had suffered frequent mosquito bites brought the fish from England. The officer, remembered as Major Selvy, introduced the Guppy to breed in water bodies surrounding the army cantonment in Bangalore where he was posted. Around the same time, authorities in Mumbai also started to use Guppy to prevent malaria, importing the fish from Texas, U.S. But despite more than a century of known use of the Guppy to control malaria, the government did not scale up such prevention. The reason, says Mangalore-based health activist Suresh Shetty, is that the government failed to introduce the practice in rural India where mosquito-borne diseases claim thousands of lives each year. According to the World Health Organisation, an estimated 3.4 billion people are at risk of malaria. In India, malaria kills nearly 20,000 people a year, by conservative estimates. About 15 million get malaria. Poor sanitation, untreated garbage, stagnant water and changing climatic conditions are seen as the main reasons behind the spread of malaria. Spraying of insecticide and use of bed nets are the most popular means to check malaria – which is completely preventable. But use of larvivorous fish like Guppy is the cheapest and the most effective malaria fighting tool, say experts. In Assam state in the north-east, scientists at the Malaria Research Centre near state capital Guwahati are breeding Guppy fish large-scale now. Sarma says the government must rope in village based NGOs, community organisations and the private sector. Bringing in corporate and financial institutions could be a good way to ensure funding, says entrepreneur Somasekhar Gowda from Mysore city, 181 km south of the southern Indian city Bangalore. Gowda has been breeding the fish, and distributing them free since May last year after four children died of dengue fever in D Salhundi village near Mysore. The deaths spread fear, and several families fled the village with their children. It was then that Gowda went to D Salhundi, and with the help of the villagers, released Guppies in more than 50 small tanks and puddles. But while there is no doubt about the effectiveness of larvivorous fishes in controlling malaria, some scientists say that large-scale introduction of Guppy can endanger the country’s biodiversity, because the fish feeds on other fish species besides mosquito larvae. The solution, they say, is to breed indigenous larvae-eating species. Vellore city in India’s southern Tamil Nadu state has been malaria-free for nearly a decade now, says local entomologist Raja Gopal. But even so, city authorities distributed 4,500 Guppy fish last month for release into local wells, to guard against spread of malaria from the thousands of medical tourists visiting Vellore each year. They have also started to use it in Uttar Pradesh state, but unfortunately, the initiative is limited to small pockets in the capital city Lucknow. We need political will to spread this practice and currently that will is missing. I was reading the WHO report that have mentioned here. It says that most of the malaria deaths occur in Africa. So, why doesn’t WHO itself promote this Guppy fish in African? Or, why doesn’t it encourage India to share its knowledge with African nations?